Having cute nail designs can certainly do wonders to a woman’s spirit. It can brighten our day and make us smile whenever we see how pretty and girly our nails are. We are always trying to find ways and designs that can make our nails more attractive and unique. Painting them is not enough anymore and we find that there is a need to somehow make our nails look better not to get complimented but to be able to feel good about them. There is a certainly a sense of satisfaction that only women will get at having such beautiful nails. Nail designs are more creative than ever with the growing popularity of nail art. We want to explore more on finding different techniques and designs that can make our nails pop. Here are a few designs from some of the most creative minds that will surely make your fingertips tingle. Moustache anyone? There is something so appealing about moustaches that we women find so hard to resist. So why bother resisting? 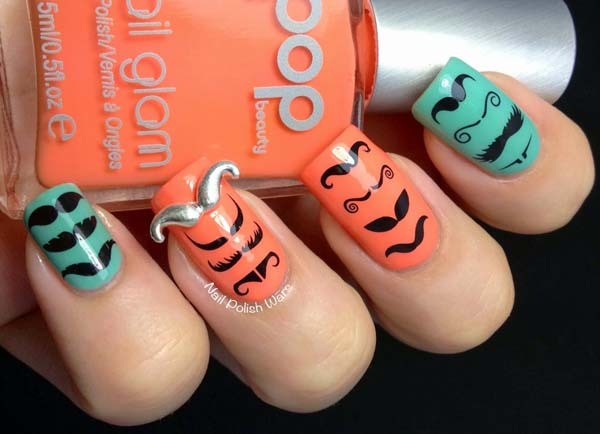 Design your nails with different moustaches and painting them in solid colour for a more dramatic effect. Pink camouflage is one of the most popular nail designs for girls. It allows us to use different shades of pink which is an all-time favourite. The pink camouflage is the perfect combination of hard and soft and a very graphic design for nails. 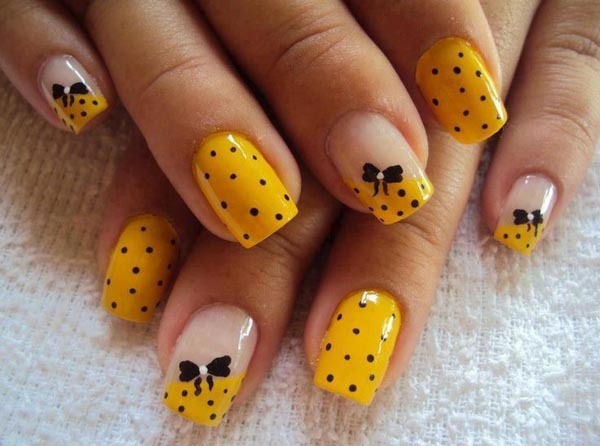 Nail designs don’t have to be very difficult to make to make them attractive. Add a bit of glitter on top of your classic French tip nail design to make it more unique and fun. 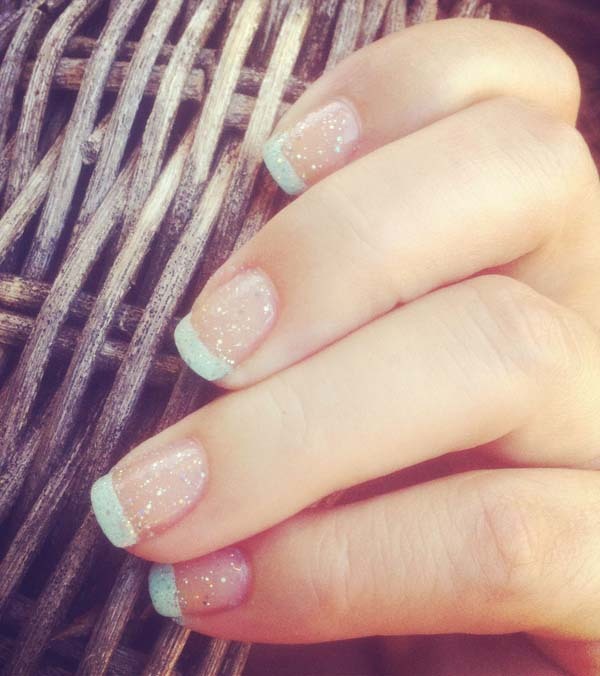 This is so simple and easy to do, you won’t need to go to a nail salon to get this done. 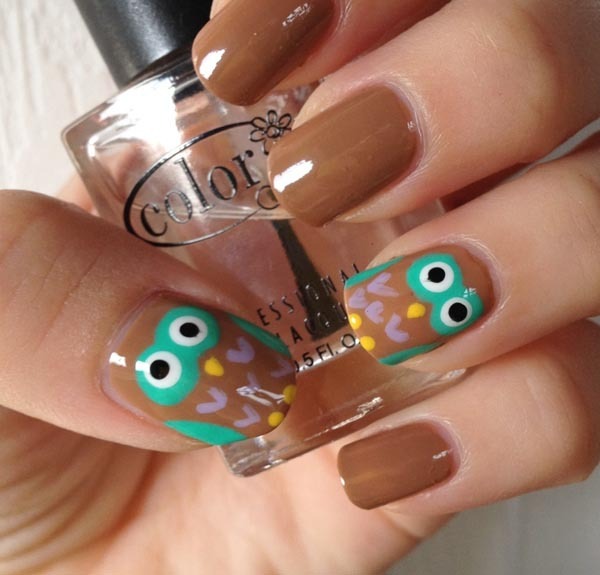 When your nail art is already so graphic like the owl design above, paint some of your nails in solid colour without the design to keep it from looking too overly designed. It also adds emphasis on the intricateness of the owl design since it is being contrasted by a simple solid colour. 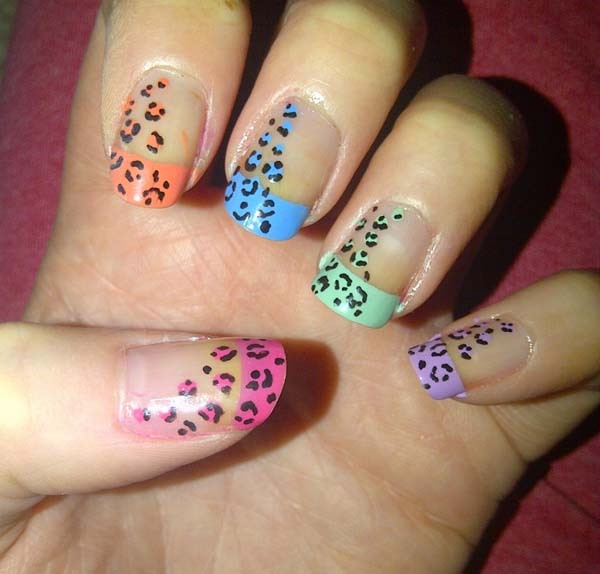 Go wild and colourful with an animal print design for your nails. You can use your favourite colours and just apply the colours only at the tip to keep it simple and neat. Got short nails? No problem, you can still have cute nail designs even when your nail is short. 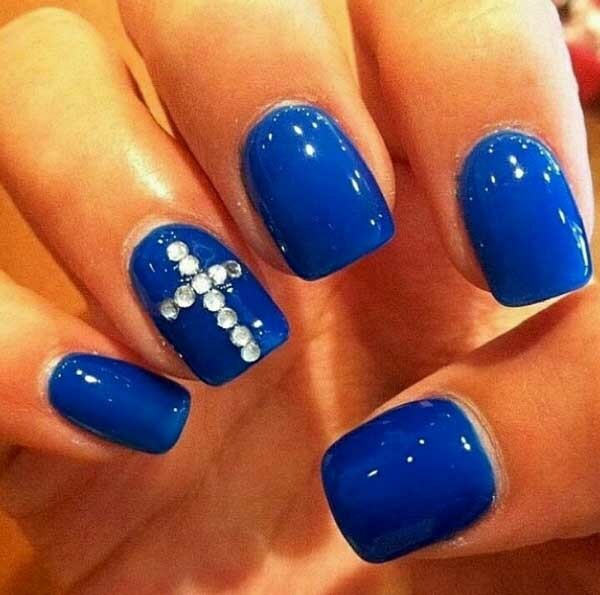 Try bold designs since your nails won’t be too loud as compared to longer nails that would call for more attention. Try using different colours and designs and glitter. Polka dots and ribbons are two of the cutest designs that we can come up with. 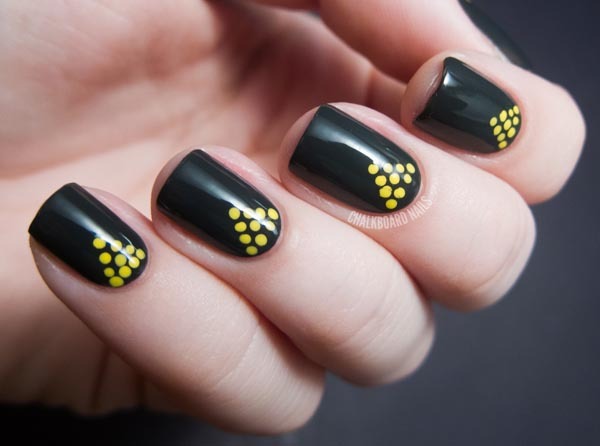 Combine yellow and black colours since they provide a stark yet colourful contrast. 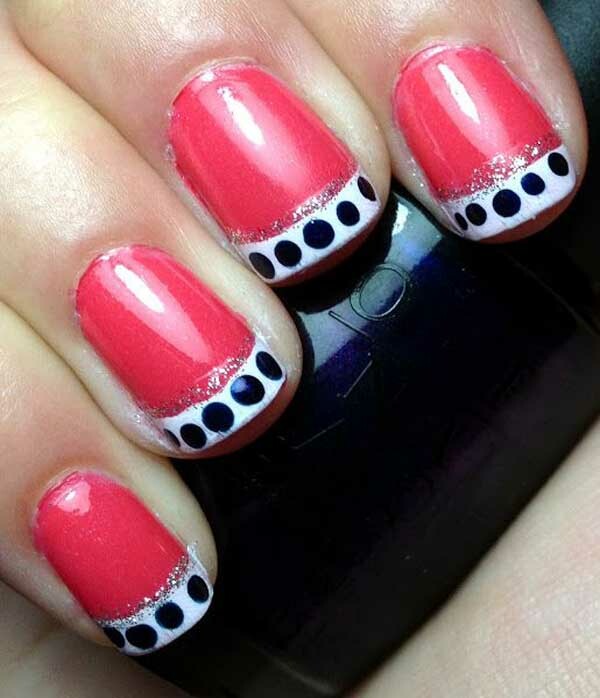 To keep the design from getting too redundant, try alternating different designs for each nail. Young girls can even have fun with their nails. They will surely love their favourite adorable characters painted on their nails. 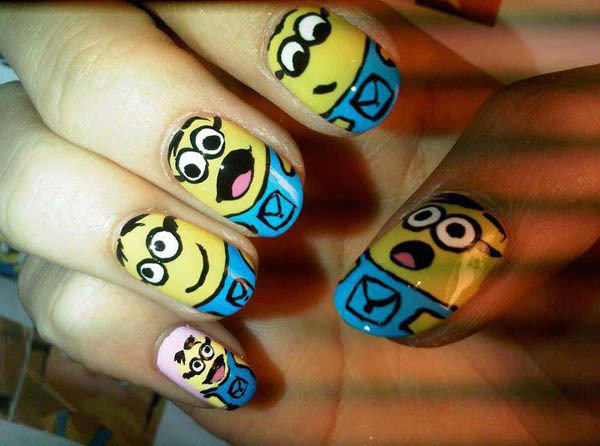 Minions are a popular choice because their shape is just perfect for nail design and they have the two most complimentary colors that make it very attractive. You don’t have to design your entire nail to have a very flamboyant design. You can merely pain the tips – but with a twist! 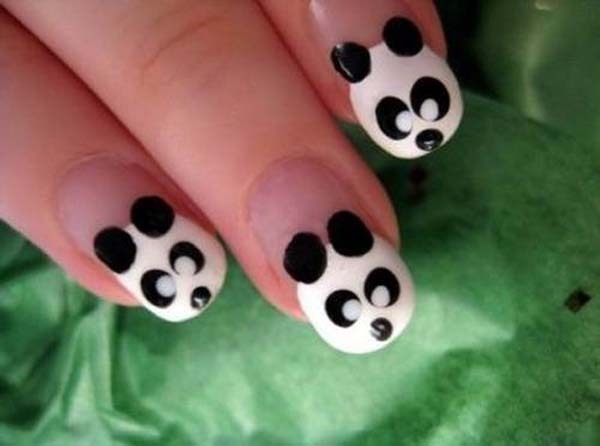 Instead of your usual French tip, try painting animal faces like pandas to make it cuter. Summer is all about the sun and fun. What better way to pay tribute to the heat of summer than to design a summer nail art? 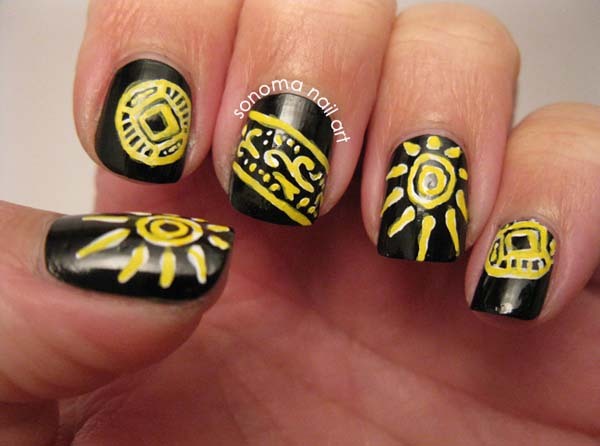 You can paint artistic sun designs and some tribal designs that we often associate with the beach. To provide a stark contrast for the vivid yellow color, paint a dark solid base to make the yellow color pop. Nail art is not just limited to our hands, we can also paint our nails too! You can have very elaborate designs for your big toe nail since it provides a wider canvas than the other toe nails. This will be the focal point which will grab the attention of everyone. French tip has always been popular as a classic nail design. We can spice the old design up with a few tweaks. Add polka dots and glitter to make it more unique and playful. We often love things that are sweet and cute, no wonder we are suckers for candies! Try a candy inspired swirl as a nail design for a cuter and more girly effect. We can always celebrate any season, even Halloween. Poke a little fun this season and get a Halloween inspired nail design. 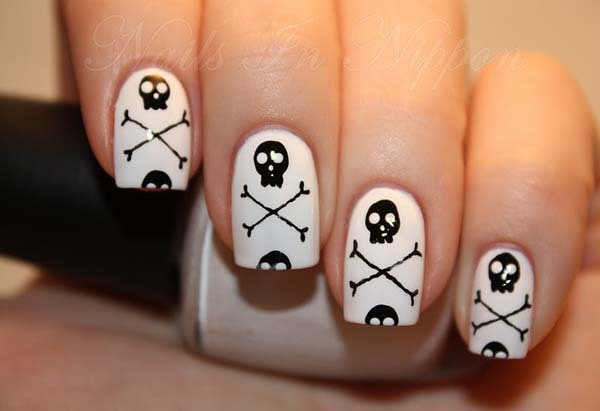 Skulls may be morbid symbols but they can be cute designs. Tis the season to be jolly! 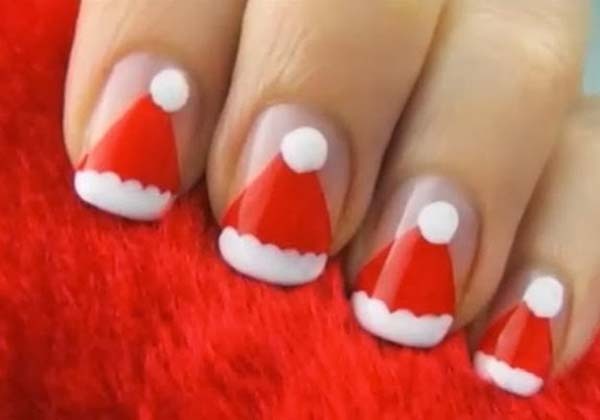 What better way to celebrate Christmas than to greet the season with a Santa inspired hat nail design? The colors are very attractive and suitable for the season of happiness. Black and white are two of the most used colors in nail art. Combining the two and you have a Goth inspired nail art design. Try to go for very graphical designs that will surely stand out. Zebras are such adorable creatures. And we have to love those stripes! Try a zebra inspired nail art design using different colors for the stripes. To keep it from looking too cluttered, just pain the fingertips. A little bling-bling always manages to add a sparkle into our lives. Use rhinestones on top of your basic colored nail polish to add to the extra punch that it needs. 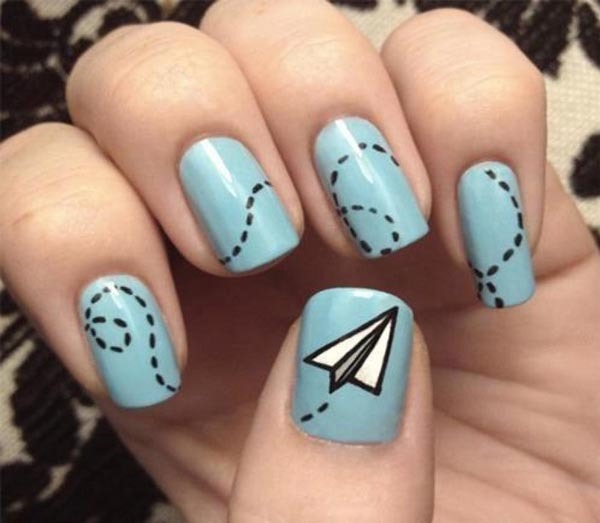 Teenagers are often more adventurous in everything, even nail designs. Adding an embossed effect to what may look like a simple nail design gives it a whole new dimension. Although black and white are serious and sombre colors, they can also be combined and designed to make the colors look cute. Purple is a lovely color for girls. Try mixing a lot of elements into your nail art design. 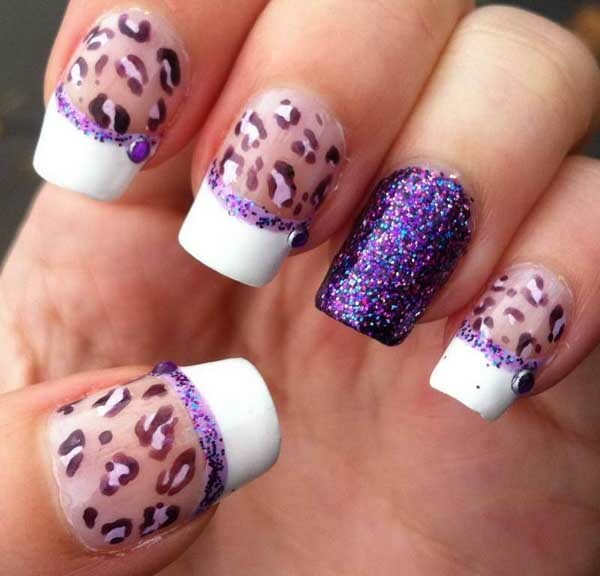 You can use animal prints, French tips, glitter and even rhinestones. 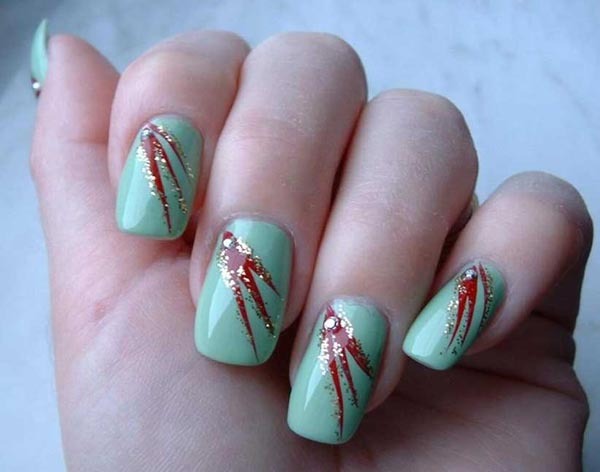 If the whole design may see a little too much, break the design by painting one nail in solid color – glitters. But of course, it has to somehow tie up with the whole design. Polka dots are so cute and adorable. And strangely enough, they make cute designs for nail art. Also, they are pretty easy to do. You can do this all by yourself without getting a professional. Long nails provide a large canvas upon which we can make long designs. To emphasize the length of the nails, color all of them in a single solid color and making long diagonal or almost vertical strokes that highlight the length and grace of your nails. Nothing to do at home? Then paint your nails creatively and think outside of the box. This is a fun project to do at home and you can get your creative juice flowing. So come up with a savvy design and paint away! 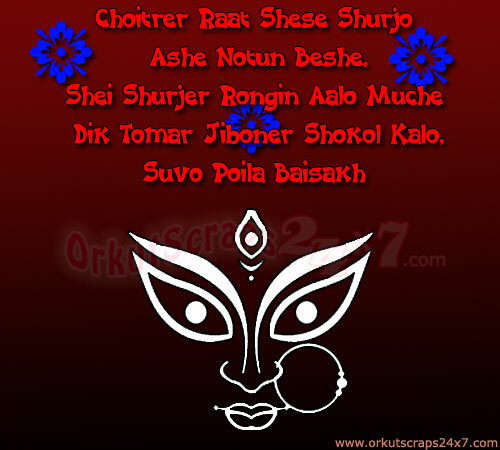 Top Bengali New Year Wishes For Everyone ! !